This article is about the Supreme Court Case Murphy v. National Collegiate Athletic Association, formerly referred to as Christie v. National Collegiate Athletic Association. 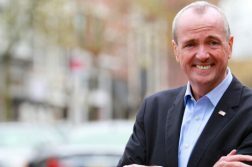 The name of the public officer representing the petitioner was updated after Phil Murphy was elected Governor of New Jersey. 5.1 When will sports betting be legal in New Jersey? 5.2 Where will I be able to bet on sports if New Jersey wins? 5.3 Will there be online sports betting? 5.4 How do people bet on sports now in New Jersey? 7 New Jersey Sports Betting: How did we get here? Oral arguments were heard on December 4th, 2017. A majority of justices appeared to side with New Jersey, according to Amy Howe. Representing New Jersey, attorney Ted Olson claimed PASPA commandeers states to enforce federal sports betting prohibition. Justices Kagan and Sotomayor expressed skepticism that PASPA requires states to act. Justices Kennedy, Roberts, Alito, Gorsuch and Breyer all appeared more receptive to this argument, noting that the federal government chose not to impose a ban on sports gambling, even though it could have. Deputy Solicitor General Jeffrey Wall, representing the United States (which sides with the sports leagues), said he’d be fine with the state repealing all of its existing state laws, rather than only certain ones such as the laws on the books in NJ prior to 2014. Justice Roberts responded by asking if that meant Wall was fine with NJ repealing age restrictions for Atlantic City casinos, allowing 12-year-olds to gamble, and Wall was caught in a trap, ultimately answering that he was indeed fine with that. Read the full transcript of the oral arguments. In the first half of 2018, the Supreme Court will release a decision that will determine the future of sports betting in New Jersey and potentially the rest of the United States. The landmark case matches departing New Jersey Gov. Chris Christie and the New Jersey Thoroughbred Association against the NCAA and four major professional sports leagues. The leagues have the support of the Trump Administration. With roots back to 2009, the case has played out while the acceptance of sports betting has increased in society and inside pro sports leagues. The NFL and NHL have decided to put franchises in Las Vegas. The WNBA also has put a team in Las Vegas, a potential precursor to the NBA’s arrival. Along with the evolving geographical landscape, the NBA has come out in support of expanding the regulated sports betting market in the U.S., under a federal framework. Major League Baseball, based on public remarks from Commissioner Rob Manfred, has begun to align itself with the NBA. But both the NBA and Major League Baseball remain in the suit against New Jersey. The NCAA and NFL remain opposed to sports betting. Other sports leagues are watching closely, too, with commissioners for the PGA and Major League Soccer speaking favorably of the benefits of regulation. And international gaming and bookmaking companies that have participated in the regulated markets in the United Kingdom and Europe are scurrying into position. But for now, all eyes are Washington, D.C., where the future of sports betting in New Jersey and the rest of the nation will be decided by nine Supreme Court justices, five of whom were nominated by Republican presidents. On Dec. 4, an hour-long oral argument between two former U.S. Solicitor Generals took place in Washington, D.C. The decision is expected to be released by the end of next June, at the latest. The case—Gov. Christopher J. Christie, Governor of New Jersey, et al vs. National Collegiate Athletic Association, et al–is centered on the Professional and Amateur Sports Protection Act of 1992 (PASPA), the federal ban on legal sports betting. PASPA prohibits state-sponsored sports betting outside of a handful of approved states. Only Nevada is allowed to offer a full menu of sports betting, including the type that generates the most betting interest – single-game, point-spread wagering. Delaware has the only other meaningful state-sponsored sports betting market in the nation, an NFL parlay scheme operated by the state lottery that handled $24 million in wagers in 2016. New Jersey lead attorney Ted Olson is arguing that PASPA is unconstitutional and should be struck down. 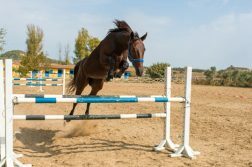 The New Jersey Thoroughbred Horsemen’s Association, represented by accomplished local attorney Ron Riccio, is also a plaintiff. Riccio believes the state’s 2014 Sports Wagering Law complies with PASPA, and, therefore, Atlantic City casinos and racetracks should be able to offer legal sports betting. The NCAA, NFL, NBA, NHL and Major League Baseball are defending PASPA and are represented by prominent attorney Paul Clement. For decades, the sports leagues have expressed concern about expanded legal sports betting being a threat to the character and integrity of their games. Critics question the sincerity behind that stance and point to the NFL and NHL’s decisions to put franchises in Las Vegas. The Vegas Golden Knights, in 2017, became the first franchise from a major professional sports league to call Las Vegas home. The Oakland Raiders have been cleared by the NFL to move to Las Vegas beginning in 2020, if not sooner. Eighteen states and the governors of Kentucky, Maryland and North Dakota have signed on in support of New Jersey. In addition to New Jersey, Connecticut, Mississippi, New York and Pennsylvania have passed legislation that will allow sports betting if the federal ban is lifted. Dozens of additional states are expected to jump into the sports betting game, if made legal. Pacific Legal Foundation, researcher John Holden, the American Gaming Association, Constitutional Law Scholars, the European Sports Security Association and U.S. Congressman Frank Pallone filed amicus briefs in favor of New Jersey. U.S. Solicitor General Noel Francisco, representing the Trump administration, and multiple groups opposed to gambling expansion filed briefs in support of the sports leagues. Francisco was granted permission by the Supreme Court to participate in the oral argument. Stop Predatory Gambling and Eagle Forum Education & Legal Defense, two groups who oppose the expansion of state-sponsored gambling, each filed amicus briefs in support of the sports leagues. There are numerous ways the case could be resolved by the Supreme Court, and many legal experts believe a nuanced decision that neither completely strikes down PASPA nor maintains the status quo in its entirety could be forthcoming. If New Jersey wins, and PASPA is lifted, the state’s race tracks — Freehold Raceway, Meadowlands Racetrack and Monmouth Park — and Atlantic City casinos will be allowed to offer legal, Las Vegas-style sports betting. Monmouth Park has a deal in place with the U.S. branch of prominent international bookmaker William Hill. With a favorable ruling from the Supreme Court, the track plans to begin offering sports betting within weeks of a favorable decision from the Supreme Court. If the leagues prevail and PASPA is upheld, New Jersey officials insist they’ll continue fighting for sports betting, and, with so many other states poised to get in the game, it doesn’t appear this issue will simply go away regardless of the Supreme Court decision. 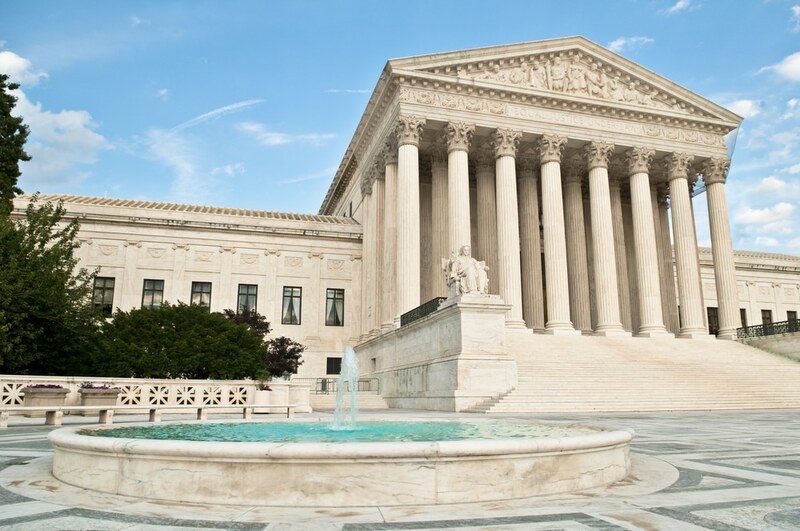 While the Supreme Court reviews PASPA, a draft of federal legislation is being pushed by U.S. Congressman Frank Pallone, a New Jersey Democrat and a ranking member of the House Energy and Commerce Committee. Pallone introduced a discussion draft of the Gaming Accountability and Modernization Enhancement Act of 2017 or GAME ACT in May. Additionally, there have been multiple calls for Congressional hearings on PASPA, including recently by multiple congressmen and another by Sen. John McCain in 2015. When will sports betting be legal in New Jersey? Everything hinges on the Supreme Court ruling expected to be released in the first half of 2018. If the Supreme Court lifts the federal ban on state-sponsored sports betting, expect sports books to be up and running by the start of the 2018 football season, if not sooner. Where will I be able to bet on sports if New Jersey wins? New Jersey plans to allow sports betting at Atlantic City casino and racetracks, the Supreme Court ruling will likely decide some of the specifics. Will there be online sports betting? New Jersey is one of a handful of states that offers legal online gambling. Director of the Division of Gaming Enforcement David Rebuck told industry trade publication EGR in October that the state is working on a regulatory framework, a combination of Nevada and United Kingdom’s models that does include online wagering. The majority of Las Vegas sportsbooks have been offering mobile sports betting apps for the past several years. How do people bet on sports now in New Jersey? While legal sports betting is restricted primarily to Nevada, Americans are not having trouble finding ways to bet. The vast majority of American sports betting takes place with offshore sportsbooks and local bookmakers, who long ago gravitated away from backroom phone centers to the internet, where they have thrived. Larger, more commercial online sports books require bettors to put money up front through credit cards or before wagering. Other shops allow players to bet on credit. In addition, New Jersey is one of a growing number of states to have passed legislation clarifying the legality of daily fantasy sports and other skill-based sports gaming options. The American Gaming Association estimates more than $150 billion is bet on sports by Americans annually, with only a small fraction taking place in a regulated market. In 2016, Nevada’s regulated sports books took $4.5 billion in bets and won $219.1 million, a 4.8 percent hold. Nevada’s 2016 population was 2.94 million. New Jersey’s 2016 population was 8.9 million, according to the United States Census Bureau. According to a 2011 analysis by Las Vegas Sports Consultants, a fully-mature New Jersey sports betting market that includes wagering at brick-and-mortar establishments and online would generate $10.2 billion in annual handle. A similar analysis done by Nevada gaming company Cal Neva projected a legal sports betting market could produce $166.2 million in tax collections. Since the New Jersey sports betting case officially began in 2012, Nevada’s sports betting market has grown by 33 percent. New Jersey Sports Betting: How did we get here? The federal prohibition on state-sponsored sports betting was put in place on Oct. 28, 1992, when President George H.W. Bush signed the Professional and Amateur Sports Protection Act into law. Nevada, Delaware, Montana and Oregon, states that already had sports betting schemes in place, were exempted from the prohibitions, and New Jersey was given a one-year window to pass legislation. Politics derailed the Garden State’s efforts, despite support from then-New Jersey casino owner Donald Trump. Nearly three decades later, as the Great Recession was taking hold and the New Jersey gaming industry was in decline, lobbying group iMEGA filed a suit challenging PASPA. The suit was ultimately dismissed in district court due to lack of standing, but along the way iMEGA teamed with New Jersey State Sen. Raymond Lesniak, who went on to spearhead the state’s sports betting efforts. Lesniak first introduced a sports betting bill in 2009 and eventually passed a referendum to put the question of legalizing sports betting to voters. At the same time, Christie was attempting to bring a Super Bowl to New Jersey. On Nov. 9, 2011, New Jersey voters supported the sports betting referendum by a two-to-one margin. Two months later, on Jan. 17, 2012, Christie signed legislation legalizing sports betting at the state’s race tracks and casinos. In July of 2012, the New Jersey Division of Gaming Enforcement published sports betting regulations on its website. Shortly after the regulations were posted, on Aug. 7, 2012, the NCAA, NFL, NBA, NHL and Major League Baseball filed suit against New Jersey and Christie, the start of what turned into a five-year legal battle that has reached the Supreme Court, but not before many twists and turns. 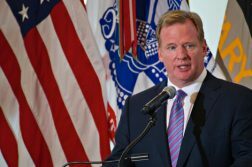 On Dec. 7, 2012, NFL Commissioner Roger Goodell was deposed in the case. Then-commissioners David Stern of the NBA, Bud Selig of MLB and Gary Bettman of the NHL each gave deposition testimony on the case, outlining the leagues opposition to expanding sports betting in the U.S. The sports leagues won in district court and appeals court and then appeared to have ended the case when the Supreme Court declined to accept New Jersey’s appeal on June 23, 2014. But Lesniak and the Garden State did not give up. Within days of the Supreme Court passing to hear New Jersey’s appeal, Lesniak introduced new legislation, the 2014 Sports Wagering Law, which attempted to comply with PASPA by repealing chunks of the state’s sports betting prohibitions, while also limiting the activity to casinos, racetracks and former sites of race tracks. The bill was quickly passed through the legislature and sent to Christie’s desk. Christie initially vetoed the bill, before reversing course in the fall. With the new law in place, Monmouth Park was within days of opening up its sports book when the sports leagues again filed suit and ultimately were granted an injunction, the beginning of the current edition of the case, commonly referred to as Christie II. On Feb. 2, 2014, Super Bowl XLVIII between the Seattle Seahawks and Denver Broncos was played at MetLife Stadium in East Rutherford, N.J. The Seahawks won 43-8. At the same time, some of the professional sports leagues were beginning to pivot their stance on legal sports betting, while also embracing daily fantasy sports. On Nov. 13, 2014, NBA commissioner Adam Silver wrote an op-ed in the New York Times, calling on Congress to create a federal framework and allow states to opt-in and offer regulated sports betting. Despite the apparent softening stances, the sports leagues maintained a leg up in the case. In Christie II, they again won in district and appeals courts, forcing New Jersey to attempt another Hail Mary and ask the Supreme Court to hear a case they declined to take three years earlier. On June 28, 2017, the Supreme Court granted cert to the New Jersey case, tossing a curveball into the ongoing legal saga that had been dominated by the sports leagues, until now. Our editorial team is comprised of seasoned New Jersey-based advantage gamblers as well as experts on the state’s online gambling industry. 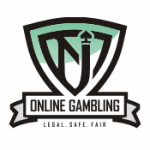 Our goal is to serve as the definitive resource on legal online casinos in the Garden State through the production of high-quality, honest and impartial content.